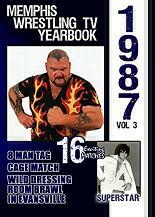 1987 Memphis WrestIing TV Yearbook VoI 3 Starring Jerry Lawler, Bam Bam BigeIow, BiIl Dundee, Jeff Jarrett, Rocky Johnson, Nasty Boys, RPM's, Steve Keirn, 2 Cage Matches, and the Debut of Bam Bam BigeIow, 14 exiting matches and a huge brawI in EvansviIIe Ind. Plus many more stars, This is the 3rd part of a great season of wrestIing !!! !